After a long planning phase and much work the new coral breeding plant has started at 6. April 2011. 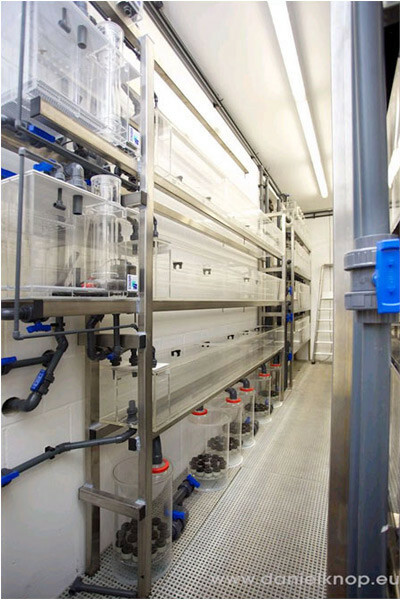 The new plant accomodates more than 30.000 corals of different species. Before I go into details I would like to thank the following companies for the support which made it possible to build this modern breeding plant: Schuran, Venotec, ATI, Tunze, GroTech and GHL. are exhausted. Due to this reason I used for the new plant just materials which lasts at least 30 years. as well as the filter are made of acrylic glass (Plexiglas). For skimming the protein I decided to use an Aquaflotor AQ 800 from the company Schuran. It has a capacity of ca. 900 litres. Due to the 3 chambers it has the ability (at a water capacity of 30.000 l/h) to reach a contact time of 2 minutes with air and ozone, before the water leaves the skimmer. After that procedure the water runs through 6 maintenance-free „residual ozone annihilator“, these are filled with 20 litres activated coal each. The outlet of the skimmer is located at an altitude of approx. 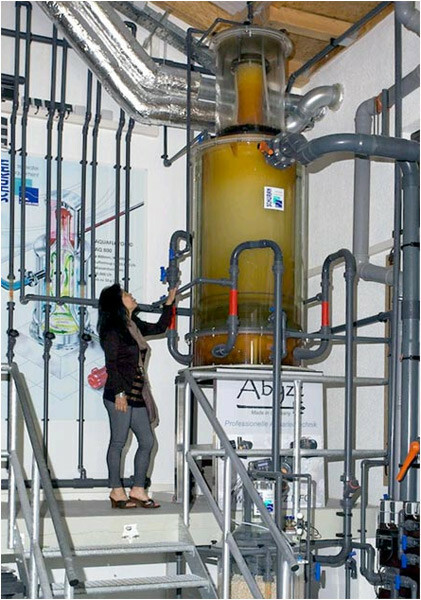 4 m therefore it can dispense the water through all aquaria because of the gravity. 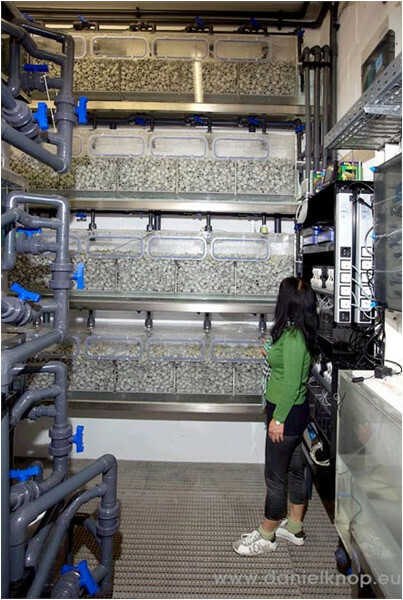 The entire content of the aquaria get pumped through the skimmer every 30 minutes. No water can reach the next basin without passing the skimmer. 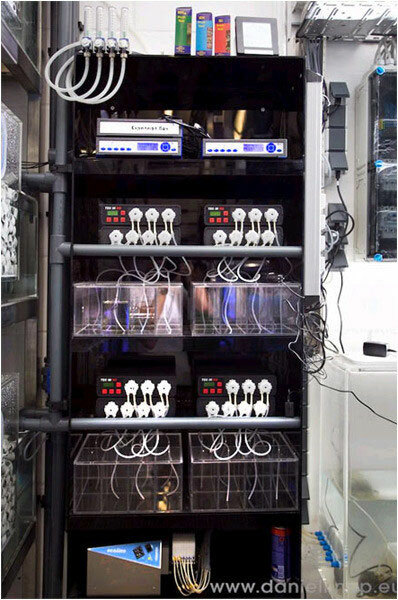 Therefore it is possible to benefit the advantage of a large water circulation and minimize the transmission risk of problems, which an aquarium can have. In my point of view it is not necessary anymore to work with living stones because of the high quality of purchasable bacterial cultures. The huge benefit is clear: You don’t get undesirable algae, bacteria, parasites and aiptasia in the aquarium. I work with bacteria from Microbe-Lift and 1.000 litres Siporax on my settlement area. I immunised the Siporax 4 weeks according to the instructions with Microbe-Lift „Special Blend“ and let it run without skimming. After the 4 weeks I prepared the remaining 17.000 litres seawater and after 3 days I attached it to the ecological system inclusive activating the skimmer. At the same time I put a mix of different new fragmented corals in the new breeding plant and even the sensitive species survived. In order to avoid unwelcome algae and bacteria in the plant I did supply „ Special Blend “ and "TheraP “ from Microbe-Lift for 1 year. the nutrient supplements etc. at least hourly some of them every 15 minutes. In this way 10% of waterchange will be dispensed regularly per week. The fish stock consists of 3.500 little fishes and shrimps. with 400 watt each you can save 16.000 kW per year. I use for 4 large basins 16 Tunze Stream with a performance from 6.500 to 12.000 litre per hour. Always two of them rotates through a Osci-Motion. In the new breeding plant are about 350 possible slots arranged for dimmable T5-Tubes, splitted in 4- and 8-fold Sunpower-lamps with a dimm-computer of the company ATI.